Decks can match the floor level of your home, from which you’ll step out onto the deck. Decks don’t require a level surface, as they’re supported by posts sitting on concrete piers in the ground. Decks don’t require excavation to clear space, as you can build a multi-tiered deck that accommodates boulders and ledges. Decks can take advantage of views by moving them up to see over other structures. Along the coast, you can see “widow’s walks” where sea captains’ wives watched for their husbands’ return. Another major reason there are more decks than patios is that homeowners find them easier to build. Where a patio may require excavation and then multiple layers of gravel and sand, a deck only needs enough ground to be dug out to sink the concrete support piers below the frost line. More homeowners have basic carpentry skills and the tools to build a deck. The masonry skills for laying a patio that will last for many years, and the equipment to excavate and prepare the base, are more complicated. 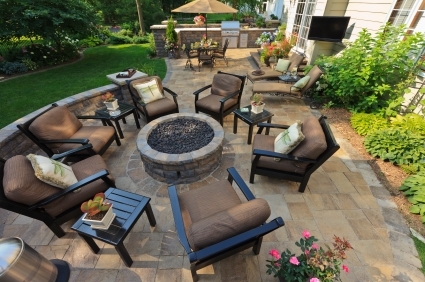 With a patio you also have to coordinate the delivery of significant amounts of material. The gravel to build a base 4 inches deep for a small, 10×10-foot patio weighs approximately 2 and a half tons. The delivery truck will dump it in your driveway and then you have to shovel it into a wheelbarrow and move it to the patio location … a long and tedious job. Freedom Fence and Home is a Maryland based company specializing in the construction of fences and decking, as well as additions, enclosures, siding, roofs and general remodeling. Best of all, we are a smaller company which means you will not be paying big company prices. If you have any questions, please contact Freedom Fence and Home by calling 443-271-6841 or visit our website. And don’t forget to take a moment to browse our gallery of wood and low maintenance decks. This entry was posted on Saturday, April 13th, 2013	at 7:56 pm	. Both comments and pings are currently closed.